"Engineering underpins the very fabric of our country and economy, from our roads and bridges to our buildings and utilities. And yet, in this country, we haven’t valued engineering anywhere near highly enough." It is a dichotomy that occupies the thoughts of Stephen Ball, the very recently-retired CEO of Lockheed Martin UK. From his vantage point, he has been able to view first-hand the growing deficit in terms of the number of engineers required by the country in order to support its growth targets and the actual figure being produced. It’s a situation exacerbated by a lack of diversity and too few entering from non-academic routes. So, if the pipeline of talent has become ‘choked’, how do we prevent the economy from wheezing and misfiring as a result? One answer might be pioneered by the Tamar Engineering Project, a new programme conceived by the University’s Development Office, and championed by Stephen. It seeks to provide financial support and mentoring opportunities for those students who come from disadvantaged backgrounds, and Stephen is leading from the front, personally mentoring a third year engineering student, Ajen Limbu, through weekly phone calls and emails. He’s really helped me focus upon communication, touching upon neurolinguistic programming, and adopting a positive frame of mind. It’s given me a great deal of confidence. Ajen Limbu has gained a remarkable insight into how Stephen would handle different situations. Stephen’s own passion was rooted in his upbringing in Cornwall, where his dad was an engineer for Cable & Wireless, and his mother an artist. Racing cars and rockets fired his imagination and led him to enrol at Plymouth Polytechnic in 1973. He says: “When I arrived it was a large version of a technical college, really nothing like the university as it is today. I think it had one computer, and you used to have to fill out a form, which would be manually processed onto punch cards. You would then put the cards into the computer and they’d run it overnight and you’d wait to see if it had worked or not. It was the award of an Honorary Doctorate of Science that reconnected Stephen to the University in 2013, and he took the opportunity to look around the Smeaton and Brunel buildings to see how things had changed – or otherwise. In January, Stephen also had an opportunity to see how the University was helping to support both Marine Academy Plymouth and University Technical College Plymouth. A firm believer in encouraging multiple routes into engineering, and not just through higher education, he was particularly struck by the standard of teaching at UTC Plymouth. 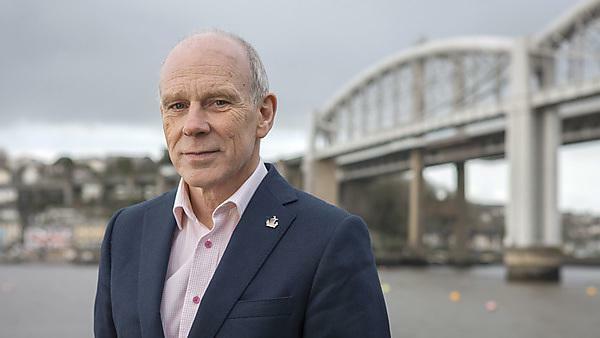 Acting as a Special Advisor to Lockheed, having retired from his CEO position in December, Stephen has pledged to meet with his contacts in industry to generate further support for the Tamar Engineering Project, and that includes senior figures in the Office for Fair Access.